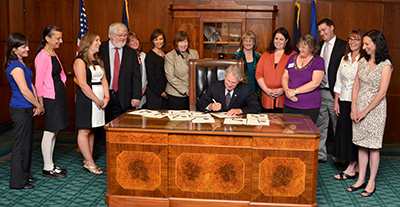 With the passage of HB 2902, Oregon becomes the first state in the nation to require insurance companies to follow ‘equal pay for equal work’ rules on insurance reimbursements for Nurse Practitioners, Physician Assistants and Physicians in primary care and mental health. Thanks to your hard work and the hard work of hundreds of nurses and NPs across the state, Oregon’s legislature successfully passed House Bill 2902 this session. The new law makes Oregon the first state in the nation to require insurance companies to provide equal reimbursements to primary care and mental health Nurse Practitioners, Physicians Assistants and Physicians, when they perform the same work and bill under the same codes. In addition to requiring ‘equal pay for equal work’ for primary care and mental health, NPs, PAs, and MDs, HB 2902 also prohibits insurers from reducing physician rates to comply with the law and creates a task force to study primary care and mental health reimbursement. The bill also includes a sunset date in 2018. Nurse practitioners and physician assistants play a critical role in delivering health care to patients in every corner of Oregon. In the face of national health care legislation and Oregon’s move toward community based care that emphasizes primary and preventive care, our citizens will grow more and more reliant on advanced practice nurses and physician assistants to provide high-quality, cost-effective care. In 2009, one of Oregon’s largest insurance companies decreased reimbursement rates for mental health services rendered by non-physician providers. Other insurance companies quickly followed suit, resulting in significant reimbursement cuts. This has caused a ripple effect throughout the mental health industry and poses a serious barrier to the ability of providers other than physicians to maintain their practices and continue to serve Oregonians in need of mental health services. When this trend started, the impact was clearly on mental health providers. Since that time, nurse practitioners and physician assistants in primary care have started receiving notice from insurers that their reimbursement rates would be reduced. As was the case with mental health, this jeopardizes patient access to care, the viability of nurse practitioner and physician assistant run small businesses and clinics that employ nurse practitioners and physician assistants, and undercuts Oregon’s stated goal of shifting to a health care system that focuses on primary and preventive care.